Baron Frederich von Steuben was born in town of Magdeburg, in the Kingdom of Prussia, on September 17, 1730. His father was a well respected Royal Prussian engineer named Captain Baron Wilhelm von Steuben, and his mother was named Elizabeth. At the age of 14, Frederich fought in the War of Austrian Succession, as a volunteer. He was accompanied by his father. Next he joined the Prussian Army as a paid soldier. He was now 17 years old. 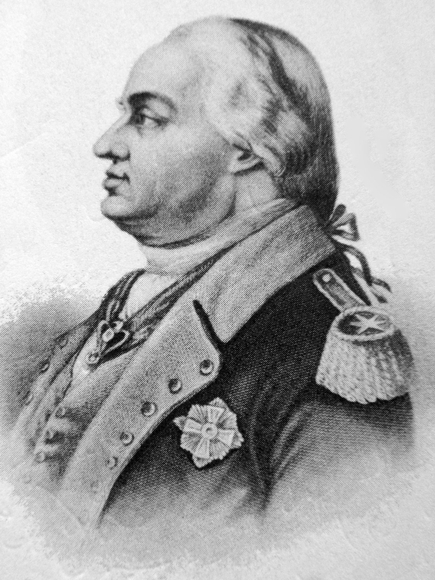 Frederich would rise to second lieutenant during the Seven Years War. Then just a few years later, he was wounded at the Battles of Prague and Kunersdorf. Frederich was taken prisoner by the Russians in 1761, and after his release was discharged by the Prussian Army. Then, in 1763, Steuben was introduced to the French Minister of War, Claude Louis. Steuben would remain essentially unemployed until 1777, when Claude Louis realized that Benjamin Franklin could use a Prussian officer with a background in staff training. When the two met Franklin was impressed. However, Franklin did not have the authority to offer Steuben a position in the Continental Army. He wrote Steuben a letter of introduction and told him if he wanted a position in the army then he would have to present himself to Congress. Steuben was advanced the funds for his travel. He left Marseilles, France on September 26, 1777 on the ship Flamand. He and two companions reached Portsmouth, Virginia on December 1, 1777. They were immediately arrested because they were wearing red uniforms which was the color that the British wore. It didn't take long before Steuben colorful personality impressed everyone. The Continental Congress worked out a deal with him. He would be paid according to how much he contributed towards winning the war, and he agreed. George Washington would not meet Fredrich von Steuben, for a few months. However, he was clearly excited the day he rode along the York Pike to meet von Steuben. Washington could not believe that a Lieutenant General from the Prussian Army had decided to help their cause. However, there had been a mistake in the translation and he soon found out that Steuben had only served as a Captain. Although it really didn't seem to matter because the two immediately became good friends. What Washington soon realized was that the Baron was exactly what the Continental Army needed. At once Steuben undertook the difficult task of taking Washington's raw troops and making them highly disciplined soldiers. Steuben spoke some French, but very little English. One of his main translators became Lieutenant Colonel Alexander Hamilton. Hamilton translated his French into English. Baron von Steuben was an amazing drill master. Shortly after arriving in Valley Forge, Pennsylvania von Steuben began working with small groups of men. Steuben worked with them from sunrise to sunset in what would become his School of the Soldier. All day he instructed them to right-face and then left face. Then as soon as he felt his first group had mastered what he was teaching he sent them back to their camps to train more men. Gradually, the Baron increased the size of the groups of soldiers. He went from working with a squad to working with a platoon. Then when he had the platoon mastered he began training entire companies, then regiments, and finally entire divisions and brigades. By the time he was done training, the Americans had an entirely new army, one that was as well disciplined as any in Europe. After the war ended Steuben was given his citizenship by the Pennsylvania legislature. He would quickly go through the money he was promised. However, in 1790, Congress gave him a $2,500 pension for the rest of his life.